Level of Difficulty: Beginner to intermediate, depending on technique. Decide on the complexity you want for your cord that best compliments your project. If you plan to make a bias-covered cord, test by folding the fabric on the bias to see how it looks: stripes work well; solid-colored taffeta also looks very nice. For a necklace, measure the length of a favorite necklace. A finished covered cord between 29" to 36" gives you the most options in finishing the ends; 36" gives you enough to tie the ends and have lots of options for how long or short to tie it. 1. For a pre-twisted or rat-tail cord, make an overhand knot. Seal the knot with seam sealant, let dry and trim. 2. For a covered cord, cut cording at least twice the finished length, and a piece of bias 1-1/2" wide by finished length plus 1". A 3/4-yard piece of fabric gives you enough un-pieced bias. You can cut bias from a smaller width and piece it on the straight of grain; these seams are a little more difficult to turn back over the cording, so it’s best to do your first cord without piecing until you understand the technique. 3. Fold the bias in half lengthwise, right sides together, and place the cord in the fold. Lay one end of the fabric in the middle of the cording, and place under the sewing machine’s presser foot; there should be enough cording extending to the back of your machine to equal the length of the bias strip. 4. Select a straight stitch, left needle position, and use adjustable zipper foot (SA161). Loosen the back screw to position the arm to the right of the needle, close but not hitting the needle. Tighten the screw. 5. Sew about a 1/4" from the right edge of the fabric. Be careful not to catch the cording as you stitch, and do not stitch so close to the cording that you will not be able to turn the fabric. Test sewing a small sample is advised, since different thickness of cording will require a wider or narrower seam. If you find it’s difficult to sew, cutting a wider piece of bias so you have more material under the foot will help; then trim the excess seam allowance after sewing. Sew across the cording and fabric at the mid-point. 6. Carefully pull the bias tube back over the cording, adjusting the seam to keep it straight. Cut off the extra cord at each end. Tuck the unfinished fabric end under about 1/4" and hand sew closed. If you plan to use a metal end cap and hook, anchor the thread in the fabric end, go through the hole of the cap, and sew the hook or ring back into the fabric. A little glue placed inside the cap will make a stronger finish. If you plan to thread beads or other jewelry over the cording, make sure they will pass over the end caps before attaching. You can purchase pre-made tassels, but they may be too big or the wrong colors for your project. Embroidery thread, especially Brother's satin finish polyester and metallic thread, makes very nice tassels. 1. Slide the needle case open so the bottom extends about 1/4" beyond the top of the cover. A piece of tape placed at the bottom helps keep the case open while you are winding the thread. Cut a piece of thread approximately 20" long and thread a needle; put ends together and tie a knot; set aside. Cut another piece of thread about a yard long and prepare the same. 2. Making a practice tassel to learn the technique is advised. Using a spool of thread, hold the end of the thread even with the bottom of the adjusted needle case, and loosely wind the thread lengthwise around the case 300 times. Cut the thread level with the bottom of the case. 4. Slip the shorter prepared needle/thread under the loops at the top of the case and tie tightly and securely, having the tie ends about the same length. It might help to slightly close the case to reduce the tension on the wound threads. Cut off needle and tie knot in thread ends to form a hanging loop if desired. 5. Slip the loops off the case. Using the longer prepared needle/thread, form a neck to the tassel by wrapping the thread 3/8" from the top of tassel about a dozen times. Then use the needle to loop back under the wrapping several times to anchor the thread. Cut off needle and trim thread ends even with bottom of tassel. 6. Tassels can be made in more than one color. Follow the same procedure, winding with two or three colors at a time. For a two-color tassel, wind the case 150 times; with three colors, wind 100 times. 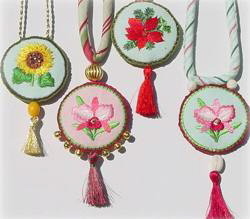 To finish pendants such as the sunflower shown above, find the center of the pre-twisted cording and tack to pendant, leaving a small space between the strands of cording. To add a bead to a tassel, slip the tie ends through the bead and then firmly attach tie ends to the pendant. For the green orchid pendant shown above, the top beads were securely sewn to the edge of the pendant and to the cording. On the pink orchid shown above, the six outer beads were added after the necklace was complete. When you use one large bead at the top, the pendant is likely to turn as you wear it; a dot of fabric glue may help to keep the bead from moving.